Each of the Drives describes a particular type of behaviour that is clearly recognisable, and differentiated from the other types of behaviours. Each of the Drives represents a continuum of behaviours, from negative energy draining behaviours which are largely driven by fears, through positive energy giving behaviours, to exaggerated behaviours where the Drive is simply taken too far, and becomes OTT (over the top). This understanding of the behavioural spectrum underlying each Drive provides one of the most powerful tools in the application of Drives. It enable clear understanding of matters such as Trust, Employee Engagement, Behavioural Risk, and Resilience in individuals and teams. Mature behaviours represent well-practiced, balanced, and effective behaviours that are likely to achieve the goals of the drive. They will be energising for the individual. Generally mature behaviours will provide the greatest productivity for an organisation. Mature behaviours enhance the adaptive capability of the individual – the ability to deal with change and/or disruption - in a way that provides resilience. Exaggerated behaviour occurs when a person is really trying to use their Drive positively, but simply take the behaviour too far. 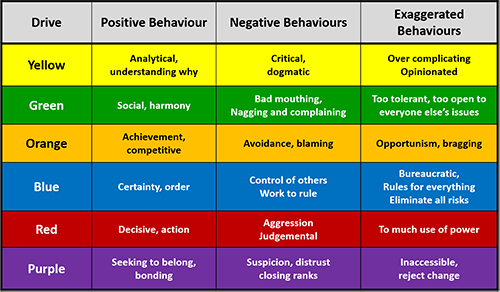 The resulting behaviours are imbalanced and create negative responses from others, hence they are ineffective. Negative behaviours are associated with fears that people may carry, each Drive presenting a different fear. Because they are fear based, they are not rational, and are not easily able to be controlled. People generally try to suppress the negative behaviours, and this takes up much of the person’s energy. Hence they are energy draining. 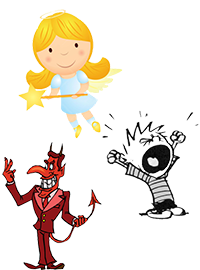 Negative behaviours are often destructive, in that they undermine the person’s ability or opportunity to achieve their goals.